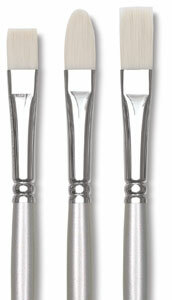 Winsor & Newton's Artisan Brushes are ideal for use with water-mixable oils or acrylics. Designed especially to achieve the best possible results when used with Winsor & Newton Artisan Water Mixable Oils, these brushes also can be used with other brands of oil and acrylic paints. 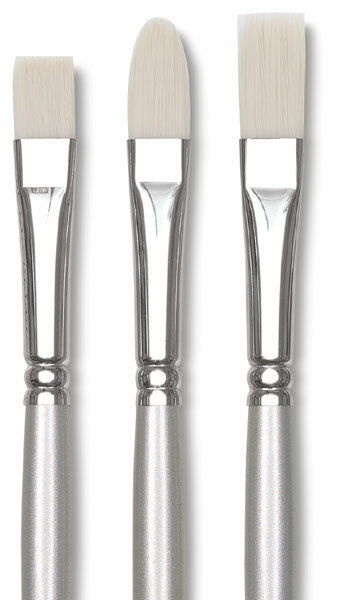 The unique blend of high-quality synthetic fibers in the Artisan Brush range is designed to mimic the performance of hog bristle, yet retain its fine point and spring after contact with water, particularly after long painting sessions. This blend of synthetic white bristles offers better performance and greater longevity than hog bristle when used with waterbased or watersoluble paints. Best of all, these brushes can be cleaned with soap and water when used with Artisan Water Mixable Oil Colors — no solvents required! Perfectly balanced for comfort and ease of handling, these long-handled brushes feature a nickel-plated ferrule and a silver, lacquered handle.